In the southwestern part of Bukhara, on the intersection of three streets, there is the Djuiboriy Kalon, which over many centuries was one of the leading centers of education in the city. 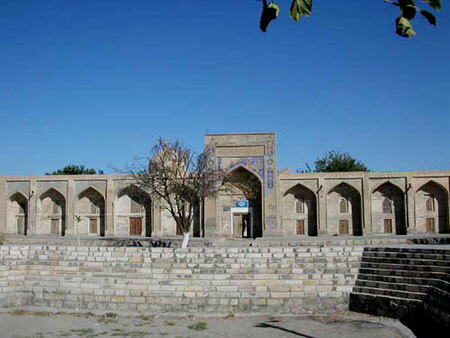 It was built in XV-XVII centuries, and till the end of XIX it was used as one of the central schools of Islam. Students from the entire Central Asia as well as Tatar youth from Russia came to study in Djuiboriy Kalon Madrasah. But today classrooms are empty and the building is declared the architectural monument (included in the UNESCO World Heritage List). Close to it there are other sights of the history of Bukhara – Validai Abullaziz-khan Madrassah, complex of Khalif Khudoyod, and drained pond “Khauz Nau”. Incidentally, this pond had ill fame, they said that “this pond attracted people and they drowned in it”. But it was brained not due to legend, but due to spread of diseases. The architecture of madrassah does not amaze with its monumentality, but it has unique features: it is the one-storey building with long facade, in which the entrances to front rooms are located. Today this sight of Bukharan history attracts neither with its architecture, nor the beauty of design, but with the rich past, which left the great mark in the history of Bukhara!